Can you tell who the quarterback is in this photo? I sure can’t. What matters is that the guy with the ball is moving forward. 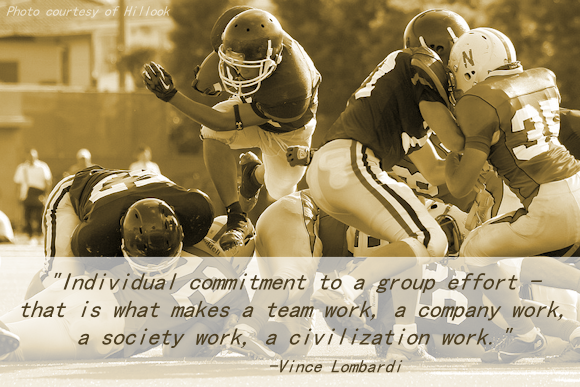 That means everyone is working together to get the job done. There’s someone else missing in this photo who is even more elusive than the quarterback…the coach. Where is he when the blocks start coming? Where is he when the ball is thrown? Truth be told, when it comes to football, we don’t even expect to see the coach blocking, tackling, or throwing. But why? Our job as players, team members, or employees is to “keep the bosses path clear, so that he can do what only he can do”. Andy Stanley said that at the Chick-fil-a Leadercast I attended a little over a week ago. It struck me. I often find myself questioning decisions I see leaders make. Depending on what I’m doing, that’s not really my job, now is it? Especially if it’s my direct boss, my job is to clear his path. My job is to block & tackle issues so that he doesn’t have to. I want my boss making big decisions. Decisions that move us forward in the game. Decisions that cause “us” to win. Simple questions. Hopefully, simple answers. The challenge here is that you have to accept your role. You may be the water-boy You may be the janitor. You may even be the assistant to one of these roles. It doesn’t matter what your level is now. It only matters that you accept it and do it the best you can, supporting your coaches strategy. In business and in life, details matter. Many of us get caught up in them. Sometimes, they can even keep us from moving forward. There’s a lot going on in the photo above. If you look at it close, it would be easy to wonder what teams are playing…what field they are playing on…what kind of league are they playing in…what player has the ball…etc. It’s easy to do this in our jobs as well. However, if you just look at the picture above as a whole, it’s a great shot! What an amazing moment to capture on film. I suggest you take a moment each day and ask the questions laid out by Andy Stanley above. Find a quiet place and time to try and answer them. Let go of the details for a bit. Try to keep your answers simple. Take a mental photo of your answers and keep them in your brains archive so that you can access them when needed. If you can do this when you are getting bogged down, it will help a lot! If you can do this and share it with your team mates or your boss, it may even cause you to inspire someone. And that would be a pretty good play, now wouldn’t it? Question: How do you keep the ball moving forward when things get complicated? Love the concept of everyone concentrating on the forward momentum. If you see your boss screwing up, though… I think you should say something to her offline. Great point LGL! By offline, I’m assuming you mean two things…not in the middle of the action and not in front of other team members. We have to tread lightly on this one depending on ego too, but you are definitely right! You’ll probably gain respect if done correctly. Thanks for adding that!! !